The first (but undoubtedly not the last) overall and detailed classification of Gesneriaceae essentially based on molecular data was published by Weber, Clark & Möller (2013). Significant prerequisites were the fairly satisfactory data situation in the neotropical Gesneriaceae (surveyed by Zimmer et al. 2002) and the molecular-systematic studies of Möller and collaborators in the Old World Gesneriaceae (e.g., Möller et al. 2009, 2011). For a detailed survey of the molecular-systematic work published until 2013, see Möller & Clark (2013). Figure 1 from “A New Formal Classification of Gesneriaceae” by Weber, Clark and Möller, Selbyana 31(2), 2013. This phyllogram defines relationships within the family based on the best available analytic tools. The most important points are the inclusion of the genus Sanango into Gesneriaceae (forming a subfamily of its own), the redefinition of some tribes and the subdivision of many tribes into subtribes. As a result, a rather complex hierarchy was reached which is thought to reflect the natural affinities of the genera and suprageneric groups in a better way than previous classifications. Several molecular-phylogenetic studies of the last years showed unequivocally that Sanango is sister to Gesneriaceae. Based on an evaluation of its morphological characters it seemed best to include it in the family. This had already been done by Wiehler (1994), who assigned Sanango to tribe Gesnerieae (now Gesnerieae-Gesneriinae) on doubtful conditions; this is definitely a wrong place. 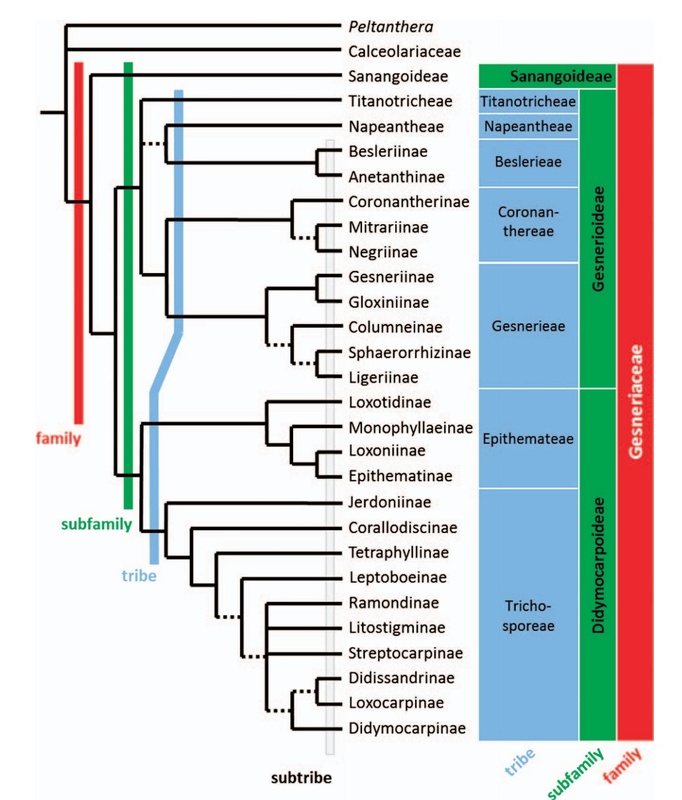 As being sister to Gesnerioideae + Didymocarpoideae it was recognized as a third subfamily, Sanangoideae by Weber et al. (2013). This inclusion amends the traditional concept of the family and makes the family distinctly older (see Age of Gesneriaceae). Subfam. Gesnerioideae was redefined to include: (1) the curious East Asian genus Titanotrichum, which forms a monospecific tribe here (For placement of the genus in the Gesnerioideae, see Wang et al. 2004 and Perret et al. 2013); (2) Beslerieae (with two subtribes), (3) Napeantheae (monogeneric); (4) the tribe Coronanthereae (with three subtribes, southern hemisphere); (5) and the exclusively neotropical tribe Gesnerieae (with five subtribes corresponding to the traditional tribes Gesnerieae, Gloxinieae, Episcieae, Sinningieae and Sphaerorrhizeae). In the Didymocarpoideae (the correct name for traditional subfam. Cyrtandroideae; almost exclusively Old World, especially E and SE Asia/Malesia, Africa, southern Europe) two tribes were recognized: (1) Epithemateae and (2) Trichosporeae (the earliest name for the ‘‘Didymocarpoid Gesneriaceae’’ sensu Weber 2004 at tribal rank). The Epithemateae comprised four very small, but morphologically and genetically very distinctive subtribes: Loxotidinae (monogeneric with Rhynchoglossum), Monophyllaeinae, Loxoniinae, and Epithematinae (monogeneric). The large group of Trichosporeae was subdivided into ten subtribes: Jerdoniinae (monospecific), Corallodiscinae (monogeneric), Tetraphyllinae (monogeneric), Leptoboeinae, Ramondinae (Europe), Litostigminae (monogeneric), Streptocarpinae (Africa and Madagascar), Didissandrinae, Loxocarpinae and Didymocarpinae. From these subtribes, Didymocarpinae proved the largest subtribe (ca. 30 genera and 1600 species) and still requires intensive study. It includes the traditional tribes Didymocarpeae, Trichosporeae and Cyrtandreae and most speciose genera such as Cyrtandra, Aeschynanthus, Agalmyla, Didymocarpus, Henckelia, Codonoboea, Oreocharis, Paraboea and Primulina. In the Figure above a graphical representation of the formal classification discussed is given. In the Tables below the classification is given with the respective genera. Papers that have been published after the classification paper (2013) deal mostly with the circumscription of particular genera. Some were particularly dramatic, including Oreocharis (inclusion of 11 Chinese genera, Möller et al. 2011), and Streptocarpus (inclusion of all African and Madagascan genera including Saintpaulia, Nishii et al 2015). Quite a number of genera have been newly described (Billolivia, Chayamaritia, Glabrella, Middletonia) or re-established (Centrosolenia, Dorcoceras, Trichodrymonia, marked by an asterisk in the Table), but all these changes did not cause a change in the classification itself. 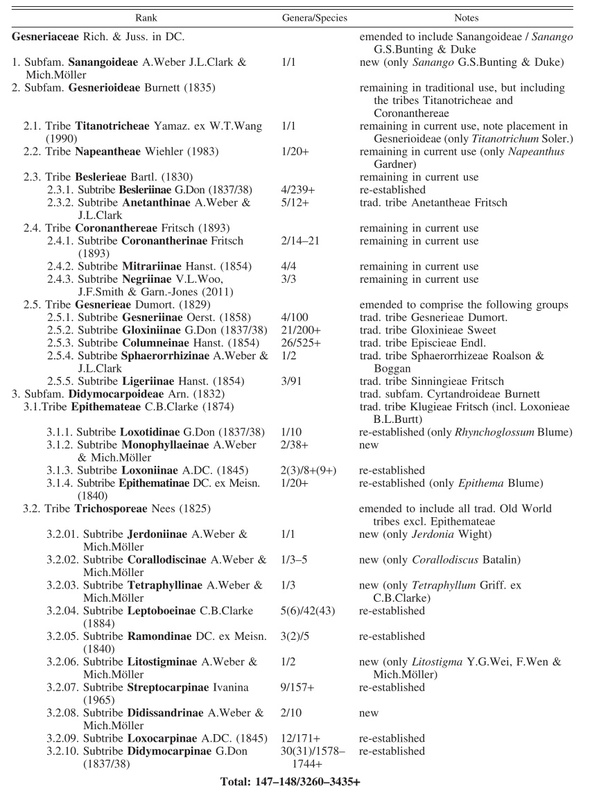 Table from “A New Formal Classification of Gesneriaceae” by Weber, Clark and Möller, Selbyana 31(2), 2013. This elaborates the information in the figure above to include numbers of genera and species, as well as additional information related to the various taxons. Hover to zoom, click to open a larger (but still zoomable) image. This Table shows the genera associated with higher level taxons. Hover to zoom, or click to see a separate (zoomable) representation of the Table.